The San Francisco Marathon is a loop course. The race starts and finishes on the Embarcadero (near the Ferry Building), traversing San Francisco. The Full Marathon runs through Fisherman’s Wharf, the Marina, across the Golden Gate Bridge (and back! ), through the Presidio and into Golden Gate Park. After a tour of Golden Gate Park, the course goes through the famous Haight Street and through the Mission, Potrero and Mission Bay Districts, passing behind AT&T Park then under the Bay Bridge to the Finish Line. 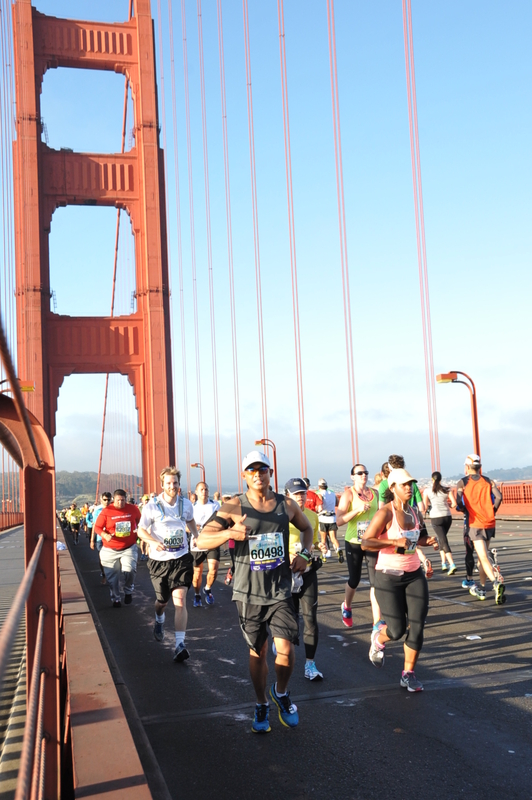 ErgoSolutions’ Kinesiologist, Charles ran the Wipro San Francisco Full Marathon on June 16, 2013. After four months of training (running 8-10 miles a day in preparation), he completed the marathon of 26.2 miles in 4:34 hours! This was his first marathon amazing accomplishment! Let’s give Charles a two thumbs up! This entry was posted on June 27, 2013 at 8:02 pm. You can follow any responses to this entry through the RSS 2.0 feed. Both comments and pings are currently closed.